This project was created by Sharon B. on her website Pin Tangle at pintangle.com and has continued on her blog. She presents excellent instructions for an embroidery stitch every Tuesday. The stitches are taken from her clearly illustrated Stitch Dictionary on the website. Followers can post their examples of each stitch to share with others. You can find her work on Instagram, Pinterest, Flickr and Facebook. #TAST Sharon designed and made an incredible crazy quilt called "I Dropped the Button Box". Her goal in designing the quilt was to use 2001 unique pieces of fabric, buttons, trims and embellishments. The quilt is a work of Art. You will find more photos of its' details on her website. I have been following her blog and doing the stitches on a sampler. It is a great reference and I have learned many new stitches. I jumped in on Stitch #44 and now am on #71. 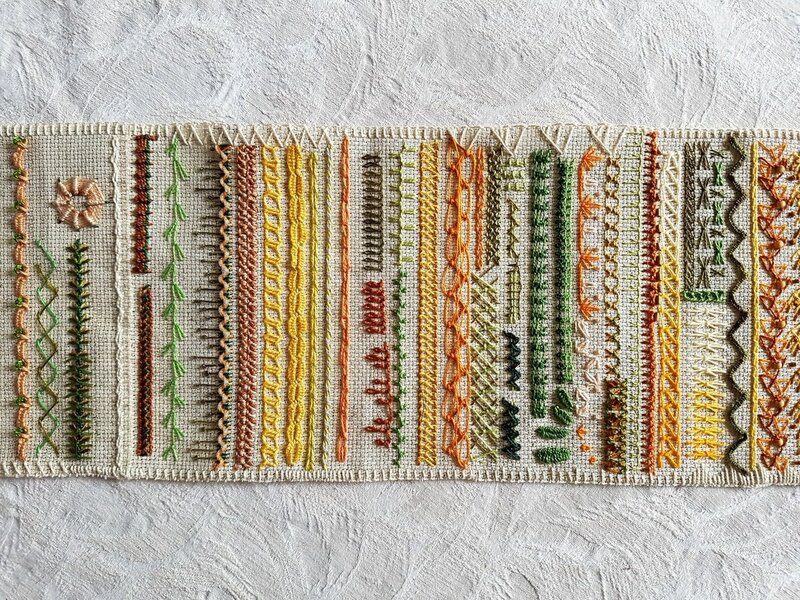 Here is a photo of part of my sampler. I have been working away on my stitches. Today is May 17/17! I see we are now on #83 this week. Sharon has written an illustrated book of her stitching, The Visual Guide to Crazy Quilt Design, available in August. I have preordered it and am so excited.